When Predators was announced in 2009, almost everybody was crossing their fingers, hoping to see Alan Silvestri make an explosive comeback. It was a MASSIVE surprise when the composer was revealed to be John Debney. The fact that most of Debney's scores up until now had been mostly light-hearted scores marked this as a major surprise. Fortunately, Debney managed to provide a score in the same league of Silvvestri's entries into the franchise. Alan Silvestri's style for the Predator franchise is brought back here, but Debney does take full advantage of it by including pounding synth and electric guitars. 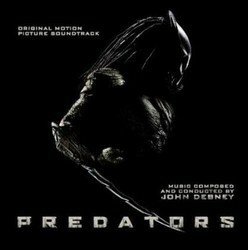 The result; a great sound that works amazingly well with the Predator theme (best heard in; 'Edwin and Isabelle Captured', 'She's Paralyzed', and 'Theme From Predator.'). Alot of the secondary music works well, from the intense orchestra in 'Free Fall' and the sweeping melodies in 'Let's Get off This Planet'. When using the orchestra, Debney captures the feeling of Alan Silvestri almost perfectly. If the album has any faults, it is that the score occasionally does lag. Debney sometimes over-uses the synth and electronics, creating a more ambient atmosphere than anything else. Fortunately, this is balanced out with the action pieces of the album. 'Hound Attack', 'Predator Attack', 'Stan's Last Stand', 'Hanzo's Last Stand', 'Predator Fight/Royce Runs', etc. all sound amazing orchestrally and actually are improved with the use of synth. 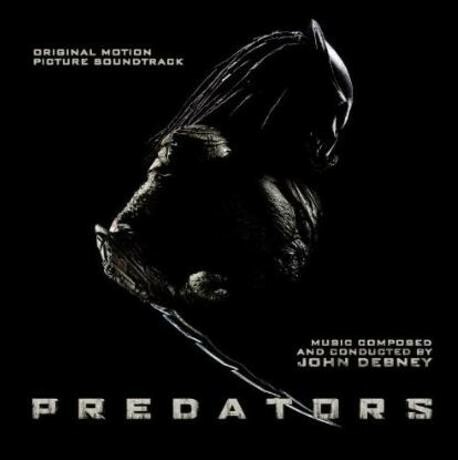 Despite the fact that Alan Silvestri couldn't return to the franchise, John Debney does a more than excellent job at capturing the feel of Predators. All of Silvestri's trademark composing skills are on display here. Even more impressive is that it comes from John Debney himself; a truly understated composer. The music here sounds great, definitely an album to check out.